As the floodwaters receded, the government encountered fresh challenges in the reconstruction of affected areas with measures for mitigation of damages from future natural disasters. All in all, the government did not face any major issue in feeding the displaced because donations out-poured from people’s largesse. Yet, the state machinery is riddled with shortcomings in the delivery of aid for people. 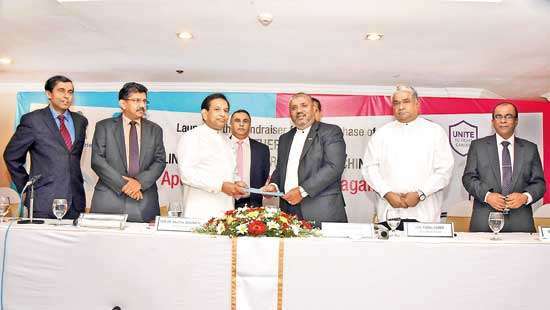 At the Cabinet meeting conducted last Tuesday, the President assigned Foreign Affairs Minister Ravi Karunanayake, Finance Minister Mangala Samaraweera and Special Projects Minister Dr. Sarath Amunugama to take steps to call for a donor conference. That is to raise funds for rebuilding the flood-hit areas of the country. However, Minister Karunanayake, as Foreign Affairs Minister, suggested that the government should declare an emergency situation first for such a conference to be called. The government was not receptive to this idea at the Cabinet meeting as it would have serious ramifications on other sectors of the economy, mainly tourism. Then, the President asked the assigned ministers to study the situation and recommend how to proceed with this proposal. Finally, it ended up to be a tentative proposal, pending other requirements to be fulfilled. For it to be done, a need assessment of the five affected districts should be done. Alongside, the Foreign Minister was asked to engage with the head of diplomatic missions in Sri Lanka to do some preparatory work. Therefore, it is a time-consuming exercise to call for a donor conference. 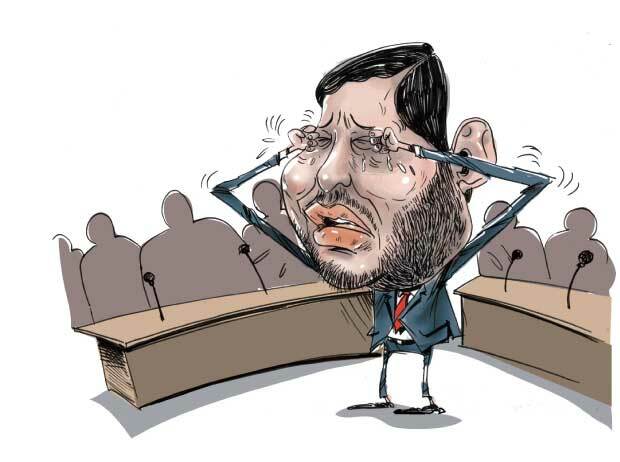 At Tuesday’s Cabinet meeting, Industry and Commerce Minister Rishad Bathiudeen made a cry that his Cabinet paper - seeking approval to privatize Lanka Mineral Sand Ltd - had been leaked out to some undesirable hands. As such, he sought to withdraw the paper. 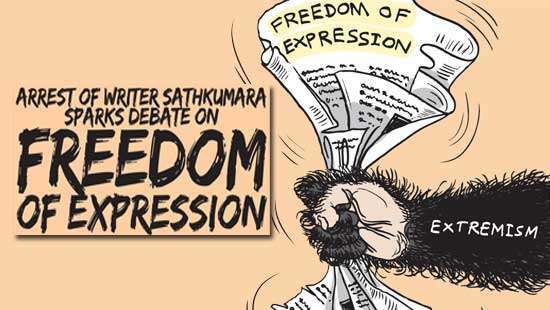 He said he would resubmit a fresh one to the Economic Management Committee headed by Prime Minister Ranil Wickremesinghe later. 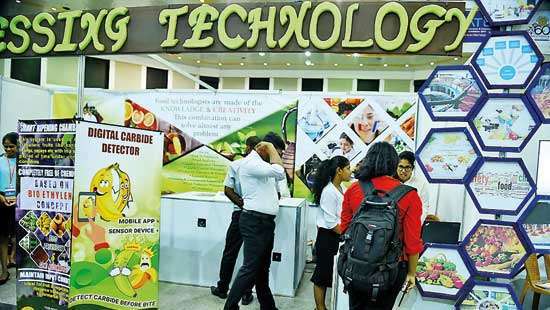 Initially, he had proposed to bring an Indian investor for this company. Rice trading was embroiled in a sort of crisis after a video footage went viral on the internet that imported ‘Basmati rice’ looked like it was made of plastic. In a video footage widely shared in the social media, a lady demonstrated how her Basmati rice turned pasty after it was cooked. She formed lumps of cooked rice and butted them on the floor to see them bouncing off a little. She even said her cooked rice remained fresh relatively for a long time. She tried to drive home the point that ‘freshness could not be retained for so long if it were natural. This made a blow to Basmati rice trading in Sri Lanka. The Cooperative Wholesale Establishment (CWE), which sold Basmati rice in this case, denied these reports. Instead, it said this appeared to be a conspiracy hatched with vested interests to bring CWE or SATHOSA to disrepute. Basmati rice is imported mainly from India and Pakistan through the normal trading channel. Besides, a certain quota of Basmati rice is imported under duty-free conditions from Pakistan under the provisions of the Free Trade Agreement (FTA) with Sri Lanka. The private sector was involved in the import of this duty free quota of Basmati from Pakistan. However, the CWE took it over from the private sector. Under the FTA, Sri Lanka has given a tariff rate quota of 6,000 tonnes of Long Grain Basmati Rice from Pakistan. In fact in 2014, the government stopped issuing licence to import any variety of Basmati rice from Pakistan till the exhaustion of this quota under the FTA. The Certificate of Origin, issued by the Pakistani authorities was accepted on the first-come-first-served basis till this quota was exhausted. However, this practice has now been done away with. The Basmati variety, that is allowed, has grains with long slender shape. The milled length of a grain should be more than 6.6 mm, and the milled breadth 2 mm. Outside the tariff rate quota, different other varieties of Basmati rice are being imported to the country, and some of them however, do not belong to the best quality category. Against this backdrop, let alone another online dialogue has been initiated by those advocating the international best practices of trading and consumer rights. These groups refer to the code of practice, adopted in the UK on Basmati rice. It has been done to provide improved protection for people who consume Basmati rice and assist local authorities in their enforcement work. According to sources, the code applies to pre-packed as well as non pre-packed rice, and where rice is used as an ingredient in other foods. Basmati rice is recognised for its unique cooking properties and distinctive aroma, and sells for two to three times the price of other long grain rice varieties. The UK code of practice on basmati rice is a result of work by the UK rice industry, British Retail Consortium (BRC), Local Authorities Coordinators of Regulatory Services (LACORS), and the Association of Public Analysts (APA). It lists the varieties that are currently approved by the Indian and Pakistani authorities that could use the description ‘Basmati’, and lays down the minimum specifications and labelling requirements for rice sold in the UK. The present crisis, involving basmati rice trading seems to have been triggered by the lack of knowledge on the quality of food items imported to the country and the measures adopted for quality assurance. Also, it is needed to have proper anti-dumping laws. Once that is done and information disseminated to consumers, such issues could be averted in the future. Meanwhile, the Association of Importers of Essential Commodities scoffed reports that ‘plastic rice’ had been imported under the pretext of basmati. A spokesman for the body said such plastic rice, as claimed, does not exist. “This looks like a conspiracy of local millers to mislead consumers about imported rice varieties. If rice is made of plastic, it would cost at least Rs.1,000 a kg. Then, we cannot sell them,” he said. 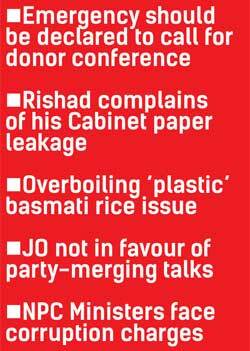 The Joint Opposition (JO) engaged in an intense debate on reports that President Maitripala Sirisena is contemplating talks with his predecessor Mahinda Rajapaksa on the measures for uniting the party. After the talks, the JO, led by MR decided forthwith that such talks were no longer necessary. It assigned MP Kumara Welgama, a close confidante of MR to announce it publicly for the people to know. The JO is sceptical that this would yet be another ploy by the President to dupe it. Instead, it is trying to hone strategies in its own in view of the future elections without any alignment with the President’s SLFP. It has come to realize that it is not feasible to work out any unity between the incumbent President and his predecessor as acrimony between them is so bad. MR is currently on a visit to Japan to attend some religious functions. Once he returns, the JO is planning some measures to mount a campaign urging the government to conduct the local authorities’ election as soon as possible. The election is overdue for more than two years as of now. Already, it has started engaging the diplomatic community in Colombo about the delay in conducting the polls. Earlier, the JO leaders such as Dinesh Gunawardane met with EU Ambassador Tung-Lai Margue. Alongside, he called on Canadian High Commissioner Shelley Whiting on the same matter. In this task, the JO has chosen to talk the embassies and High Commissions of the countries that espouse elections as the pillars of democracy. Northern Province Chief Minister C.V. Wigneswaran appointed a committee to investigate allegations of corruption and malpractices against the Provincial Board of Ministers. The report was to be submitted to the Chief Minister yesterday. The TNA controls the Provincial Council. All the provincial ministers belong to the TNA. Nonetheless, it is learnt that evidence has been given before this committee against these ministers mostly by those representing the TNA. It looks like an internal issue of the TNA as a result.